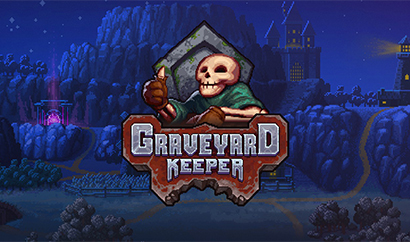 Developed by Lazy Bear Games and tinyBuild, Graveyard Keeper is an RPG simulation video game, available for the Windows, Mac OS X, and Linux operating systems. 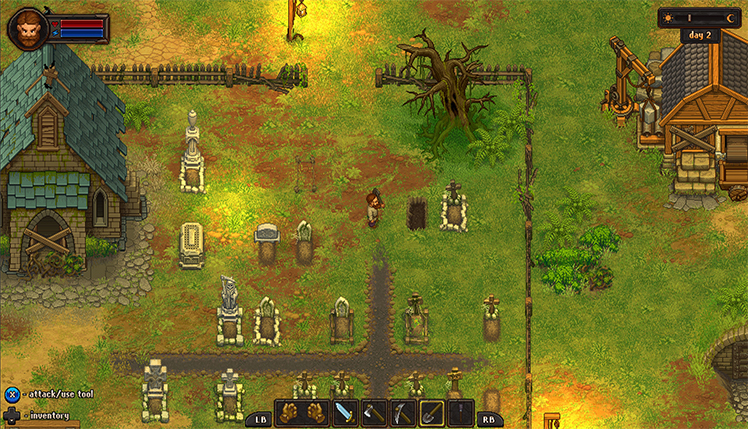 Dark comedy has a new face in this game where players manage a graveyard near two different settlements. Players are guided by the strange yet often hilariously weird ramblings of an amnesiac skull. Bury the dead, but not before harvesting their flesh, organs, and anything else that might be helpful. 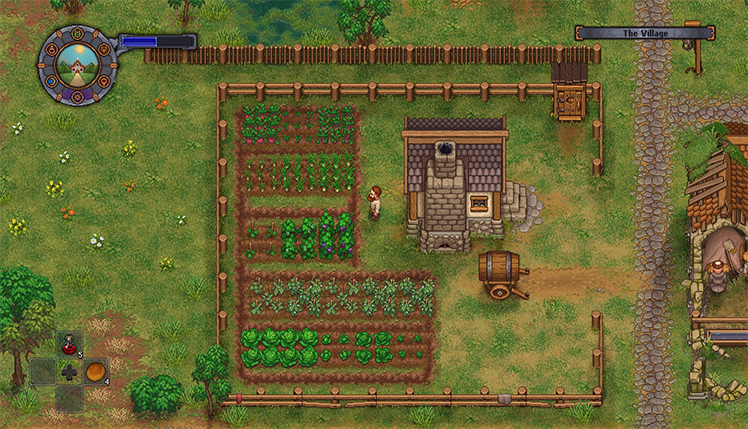 Unlock tons of skill trees and take up farming, gathering, or a number of other jobs. However, players are always the area's grave keeper first and foremost. While making money is the main goal, there is also a social aspect in this game. Players make ethical decisions regarding the NPCs they encounter. Open a church and use the tithes to make the lives of people better, or hoard it all and become a rich miser. Show people a heart of gold or be the weird recluse. The possibilities are many! This video game is very expansive in its RPG elements. 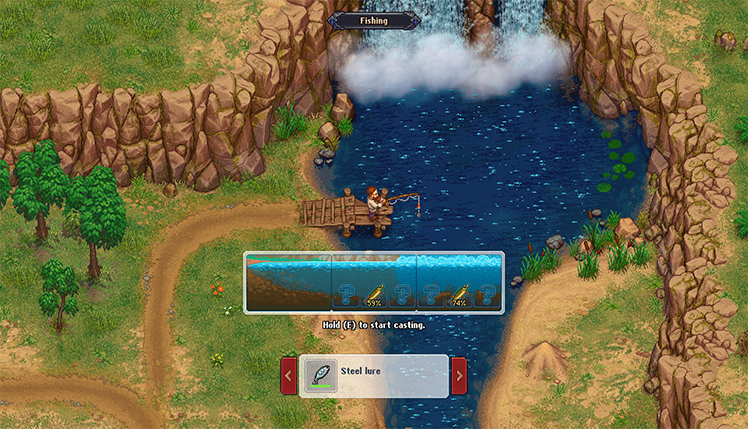 For example, there are skill trees that help players focus on different things. Become an expert stone mason, use lumber more effectively, and even keep bees nearby. Study the arcane, become a farmer, even explore dungeons and find valuable treasure. Earn experience by completing lots of different tasks and use it to unlock all of these skills plus more! Additionally, there are also quests that players complete. 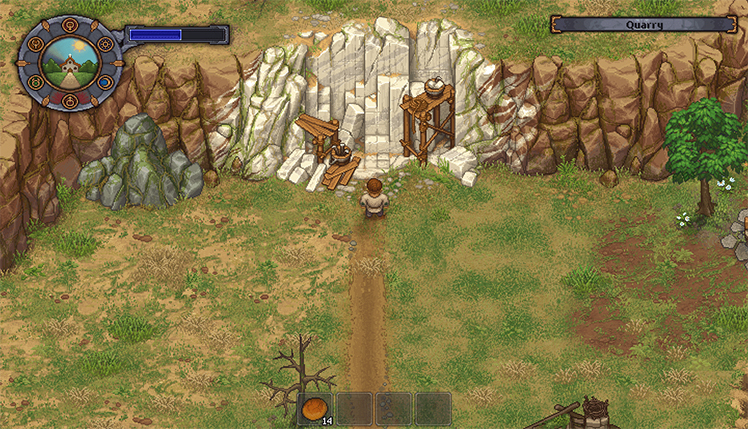 Different villagers and townspeople request items or have tasks they want the grave keeper to do. Either do as they request or become the grumpy old hermit that smells like dead bodies all the time. Get hilarious chat options and watch as many new paths open based on other decisions. Become a beloved part of the community while developing friendships and romances. Players can open the church attached to the graveyard and become ministers, creating an entirely new way to profit off of the townspeople and even tourists. 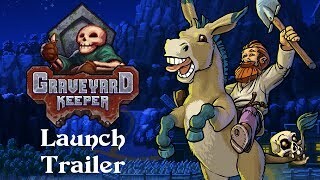 Graveyard Keeper is a simulator video game with a wicked sense of humor. Players manage a graveyard and so much more. Make money burying bodies while also farming, adventuring, and even running the chapel. 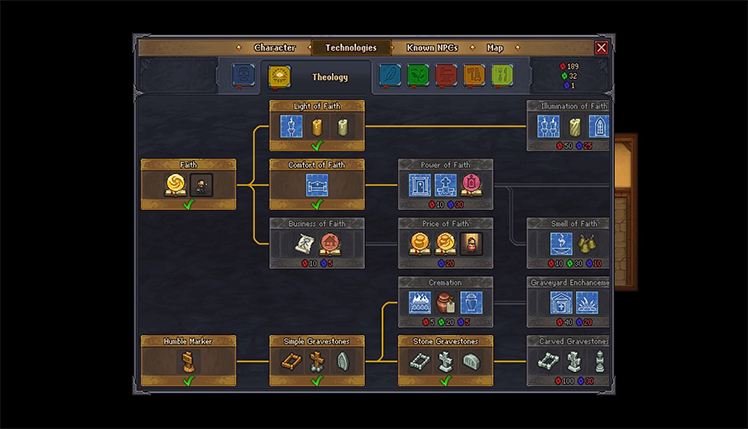 Gain experience doing tons of different tasks and get better at skills in the expansive skill trees. The RPG elements in this hilarious tale mean that players choose from tons of different paths or pursue them all. Befriend villagers and churchgoers alike or tell them all off and be the weird, smelly grave keeper. Feed on the bodies brought to the graveyard or treat them with respect and create a beautiful sanctuary for the dead. With so many ways to make money, there's no end to the adventure in this comedic RPG simulation! 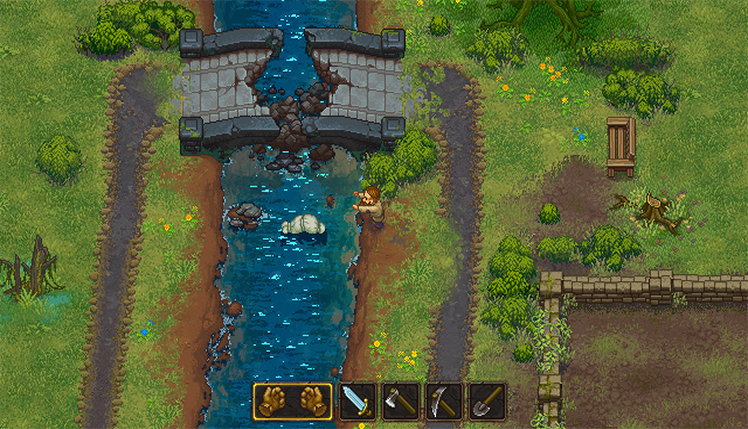 Unleash your inner capitalist in the morbid world of Graveyard Keeper. 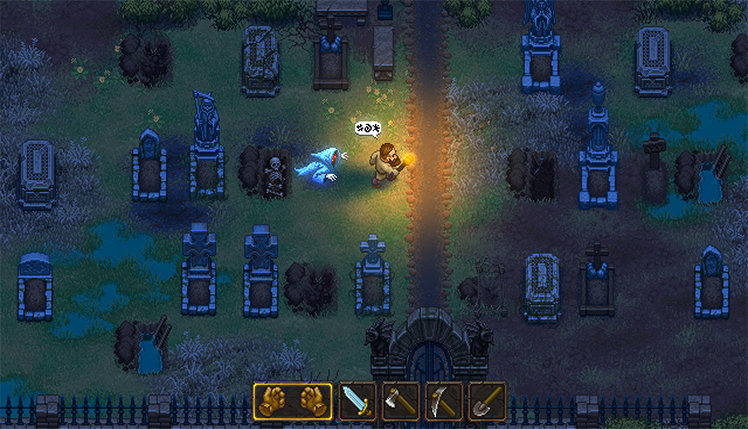 Your goal is to build and manage your own graveyard in this chilling RPG. You will do whatever it takes for your business to thrive. © 2018, Lazy Bear Games. Lazy Bear Games logo, Graveyard Keeper, the Graveyard Keeper logo, are trademarks or registered trademarks of Lazy Bear Games. in the United States of America and elsewhere. All rights reserved.